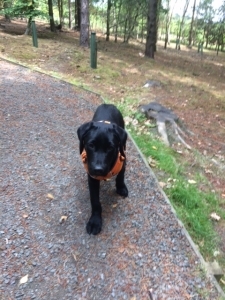 The village of Bardon Mill is a 30 minute (downhill) walk from Layside and well worth a visit if only to appreciate a good coffee and home-made scone, cake or sandwich at the Village Store and Tea Room. Positioned adjacent to the Village Green, the store is at the heart of the village and owner Mike provides a warm welcome seven days a week. Opposite is the Errington Reay pottery which started life as a water-powered woollen mill in the mid-1700s before it was burnt down by an employee, Harvey, whose ghost is said to remain in the upstairs of the building. The pottery was founded in 1878 by William Reay and Robert Errington. Originally specialising in clay sewerage pipes then from the 1970s (following the advent of plastic pipes), it diversified to produce garden pots, which quickly became popular with clients from across the country. 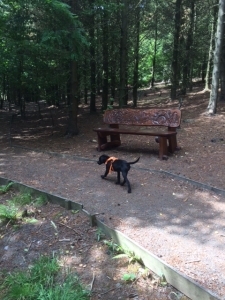 The park is also well worth a visit – Bart took a short stroll following the Pitman’s Trail which was once the site of the Bardon Mill Colliery (once employing 300 men and producing more than 156,000 tonnes of coal every year). 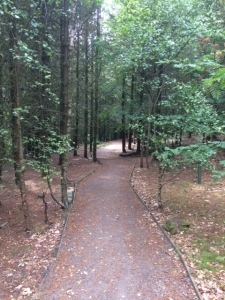 Following the hard work of a team of local volunteers, the reclaimed woodland is flourishing and provides a great backdrop to the state-of-the-art community building (the UK’s only earth-sheltered village hall)! Now that July is here we hope that the glorious weather we have been enjoying over the past few weeks continues. 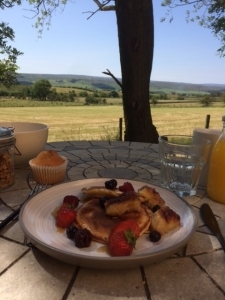 Guests have been making good use of the outdoor space – it is not often that you can eat your breakfast outside in Northumberland without the need for a coat (or a brolly)! 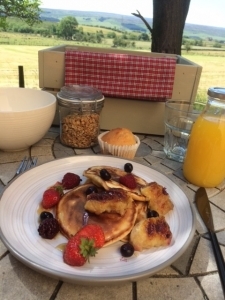 For July’s breakfast special we have introduced the Layside pancake stack – a perfect option for a warm morning. 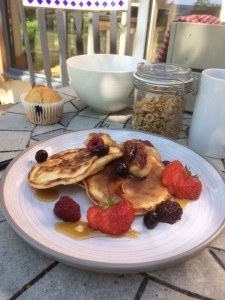 Enjoy home cooked scotch pancakes with banana griddled on the Aga, garnished with berries and a healthy drizzle of maple syrup. We can’t quite believe that it is June already. We are still blessed with some warm weather – the Northumberland moors and hills bathed in sunlight and lovely walking conditions. New to the breakfast menu for this month is a beef brisket hash – brined with spices over five days, slow cooked in the Aga, then pulled and served with diced potatoes sauteed with onion and butter, then topped with a Bardon Mill free-range egg – designed to set you up for whatever the day holds! Despite the drop in temperature over the past few days, the sun is shining and the promise of summer hangs in the air. The swallows have returned to nest in the outhouses and the pied wagtails have again decided that it is a good idea to nest underneath Kev’s car, so journeys are kept short and to an absolute minimum! The evening light is beautiful and if you are lucky you may see our resident Northumberland Hare and it’s young – spotted over the past few evenings in close proximity to the vegetable patch. 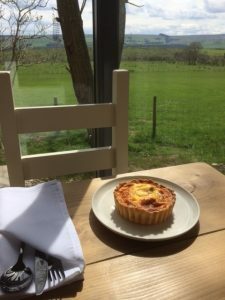 For a “breakfast special” for May we have introduced a breakfast quiche, using local Bardon Mill free-range eggs, Cumberland sausage, smoked bacon and mushrooms, and finished with Northumberland cheese. 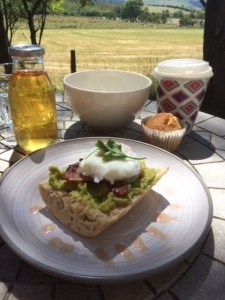 Freshly baked to order and served warm from the Aga, this tasty addition to the breakfast menu combines all the elements of a traditional cooked breakfast in one, delivered to your door. Enjoy! Greenhead is a small village in the heart of Hadrian’s Wall Country. A village market is held at the Greenhead Village Hall on the second Sunday of every month from 10 am to 2 pm (in April it will be held on Sunday 8th)! It is a great opportunity to meet local producers with a wide range of locally produced foods and crafts on sale. Greenhead itself is well worth a visit – the area was mined for coal from the 18th century and supported a large population of miners and quarraymen. Today this friendly village offers welcoming hostelries and tearooms and easy walks can be taken beside the river at Thirlwall. A short distance away is the Roman Army Museum and Walltown Quarry, Birdoswold Roman Fort and Thirlwall Castle. 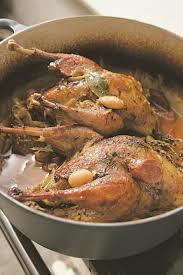 On the menu this week for our evening meal we have a rustic French-style duck cassoulet, slow cooked in the Aga then served off the bone with smoked lardons, Toulouse sausage and cannellini beans in a rich tomato sauce. We also have a traditional country-style chicken casserole cooked on the bone with baby carrots and potatoes – both are served with crusty bread baked in the Aga. Our pudding this week is a dark chocolate orange tart, homemade and garnished with fruit.